The Bank of Canada hiked interest rates again today. Bank of Canada governor Stephen Poloz raised rates by another 25 basis points, it was the third time in the past six months. Rates have more than doubled in that time, going from 0.50 to 1.25. Bank of Canada Historical Interest Rates. This is critically important considering the context of the current situation. Interest rates have been at historically low, emergency levels since the financial crisis. This has allowed households to absorb elevated house prices and a record amount of debt. Each rate hike reduces the ability to service that debt. A 1% rate increase to Vancouver mortgages would require an additional 9% of income. Following the Bank of Canada announcement the big Canadian banks all hiked their prime lending rate by 25 basis points. The prime lending rate is the annual interest rate Canada’s major banks use to set interest rates on variable loans, lines of credit, variable-rate mortgages, and HELOCs (Home Equity Lines of credit). In summary, every borrower carrying a line of credit, variable rate mortgage, or HELOC will be saddled with higher interest payments. 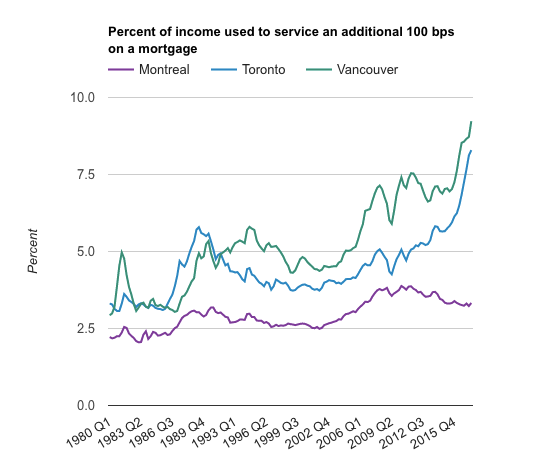 This will put pressure on the HELOC phenomenon, which has seen balances increase by 500% since the year 2000 to a total of $211B and variable rate mortgages which make up 29% of Canadian mortgages per RateHub.